Ten days ago, I completed a course of prednisolone and anti-biotics, I inwardly celebrated as I seemed to have recovered from the infection pretty quickly and within ten days, all was back to a state of “normality for me”. Excellent. Yesterday, I removed my swimming gear, from my suitcase, and chucked it in the car. I was planning on a swim after work. Just after lunchtime, I noticed some slight breathless, unconcerned I had a couple of puffs of my inhaler and carried on with my day. An hour later, I suddenly became very breathless, uncomfortably so. Concerned, I considered having a nebuliser, but settled for 10 puffs of ventolin. It worked. I also noticed my throat felt “itchy”. Deciding that, the most likely cause, was an allergic reaction, to the elevated pollen levels. Though they are not particularly high, everything is coming into bud and bloom, I headed to the pharmacy. I purchased some “over the counter” anti-histamines, obviously took one, then got on with my day, feeling much better. I decided to abandon the plan of going for a swim, deciding my asthma, was too unstable. Last night, I had a rough night, needing my nebuliser in the early hours. This morning I have awoken, to a painful, sore throat and feeling breathless and wheezy. It’s now, quite evident, that something unwelcome, has set up home and is busy growing. It’s too early to start my second course of prednisolone and anti-biotics, but I know it’s going to be the likely outcome. So is not being able to swim for at least two weeks. Frustrated doesn’t come close! Sorry for the lack of posts over the last week, I’ve been on holiday. Clacton, UK in March is not a particularly warm place to be, so no outdoor swimming, but the the holiday village had an indoor pool, so swimming was an activity option, that was taken. What the holiday village didn’t have, was a reliable mobile internet. The mobile connection was at best, variable, slight movements of my phone, saw me go from a half decent connection, to absolutely no connection so I gave up on any plans of updating my blog. I had a great holiday, throughly enjoyed myself. It was a much needed break. I went on holiday with my friends Lucy and Peter Barrett, Peter very kindly agreed, with the permission of the lifeguards, to take some underwater photos of me, as I swam, which I will share on this blog on a future post. I am heading home tonight, so I will update my blog, properly, over the Easter Weekend. 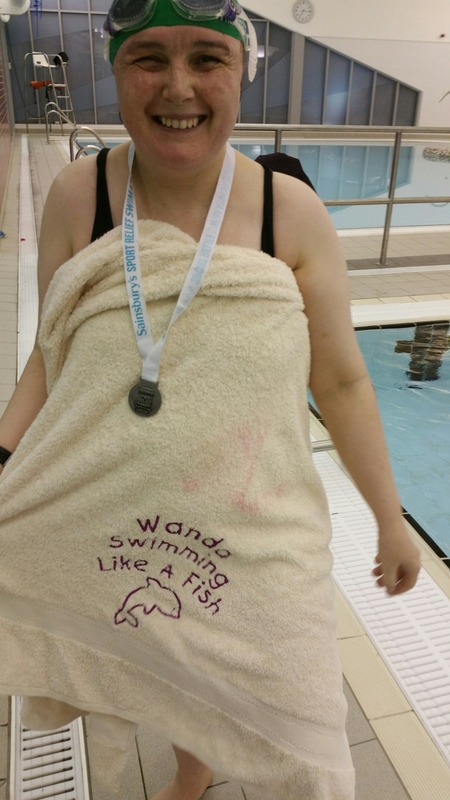 I can not think of a more appropriate title, than this, I did it, I completed it, swam 1.5km without stopping, in 1 hour 51 seconds, and raised over £200 for Sport relief foundation. I’m incredibly proud, of my achievement. I am also so, so grateful to the army of people who supported me and sponsored me. I will dedicate a post to the event, once I have come back down to earth a bit. But here’s a photo, to start with, smiling proudly, with my finishers medal. I can’t believe, the days finally here, I am so excited. Yes I’m nervous, as well, but I know I can do this, smash this. I’ve got a busy day ahead, at work, which in a way is a good thing, far better than sitting around, in nervous anticipation. Breakfast is eaten and the rest of the day’s food is planned…bring on the jelly babies!!! Tonight, I headed back to the pool. 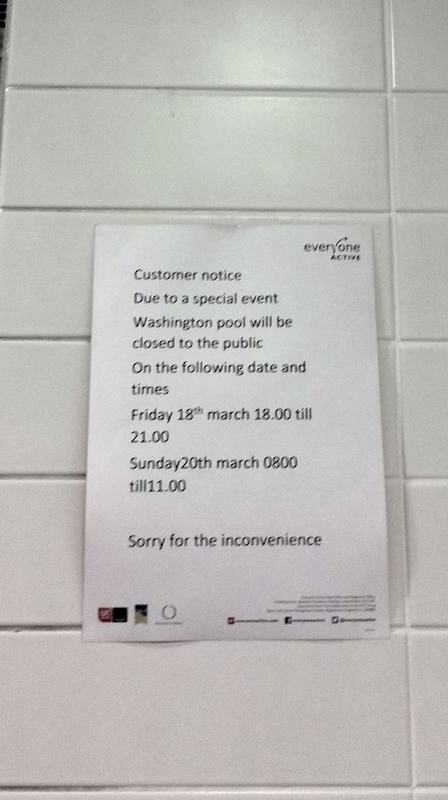 This time to Washington Pool, where I will undertaking, my Swimathon. I wanted to be confident, that I knew where to go, what the parking was like, what facilities were available what the pool was like. It soon proved to be a good move, as it took me ages to locate it, round the back of Asda. Parking, I discovered, was horrendous, with little room to manouver round the car park, no disabled bays were available, filled with, as so often happens, several people not displaying blue badges. If you want my parking space, you can have my disability! It infuriates me! Once I’d parked up, I spent a few minutes outside, just thinking and centemplating. It’s over-whelming, to think that in a couple of days time, I’ll be back here for swimathon. Where has the last 10 weeks gone? I was informed, the card was no longer valid, as the pool is now ran by “Everyone Active”, would I like a replacement, without thinking, I replied “yes”. I nearly had heart failure when I was charged over £17, for a card and a swim. Talk about taking your eyes out and coming back for the sockets! My Sunderland Active Card was only 10 months old! I really don’t mind paying £16.00 for a lesson, because it’s worth every penny, but I thought that, that was a tad excessive. It’s all relative, I guess. 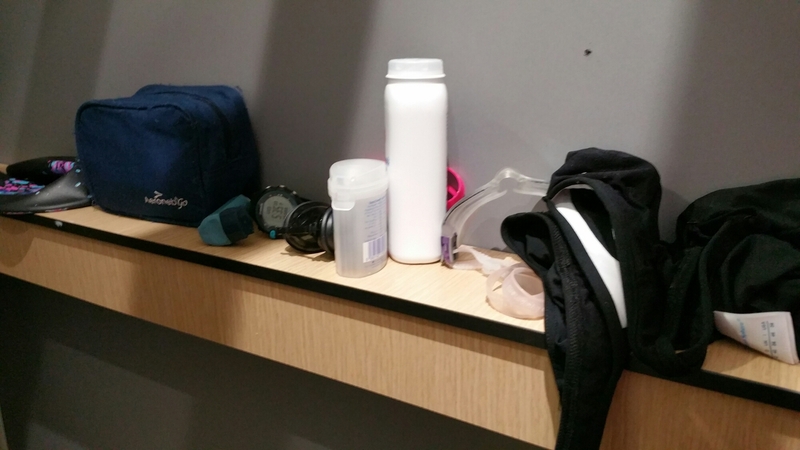 Eventually, once changed, I located a locker, stowed my gear in it and headed to the pool. On entering the pool, two things caught my eye. The pool was rammed and secondly, the two amazing and fun looking slides. Can adults have a go, I thought? On Friday, I may bomb down them both, in celebration of completing my swim. They looked ace! I leapt into the pool, to a bit of a suprise, the deep end, is at the opposite end to what I’m used to. Thankfully, there was a lane avaliable and I bagged it, it was good to see people observing lane etiquette and not using the lane for their personal space, for a natter with their mates, as happened a few weeks ago. As soon as I started to swim, I was able to recognise that tonight’s swim, felt much better than what it had the previous night, maybe because I felt better, more confident and assured. A few lengths to warm up and then I then I set off, on a longer swim. I set myself the target of swimming for forty-five minutes continuous. It was, at times, hard going. I am learning now, if breathless becomes an issue, to always switch to a “slow breast stroke” that way I can focus on getting my breathing, back under control. At the same time, I’m thinking, in my head, relax, relax, relax! as advised by J. I am beginning to recognise, that trying to speed up, to reach the end of the lane, when I am feeling puffed, actually makes it worse. It’s a continual learning process and not one that’s easy. It’s about being aware of me, my body, my stroke, everything. The time, crept round, I kept going, up and down the pool. At the same time, identifying the landmarks, telling me where I am in the pool, how far up the lane I am. Washington pool, I found is great for this, it has a number of posters along the side if the pool advising parents and participants of different ASA levels, where to meet. I just need to remember, which way round they go, That’s not to say, I don’t know how to count! As I swam, I felt myself, fall back into my regular rythym and pattern, it started to feel really comfortable again. The time slipped by, suddenly fourty minutes had elapsed. I determined to swim another six lengths. And then I stopped. Fifty two minutes had elapsed, since I had started, I had swam 1250m. I was happy with that, pleasantly suprised in fact, yet disappointed at the same time. I had another 10 lengths to complete, to reach 1500m, meaning that I would not of completed my challenge sub-one hour, my goal. However, there is little point, in me being unhappy, with where I am. It’s not a race, it’s a challenge, 10 months ago I could barely swim, three months ago I could manage 800m, I’ve come a long way. I need to be proud, happy, not disappointed. Last week, I was unwell, too unwell to swim, this week I’m better, but asthma is still not great. I finished with a cool down, of a few more lengths, meaning that I totalled 1650 metres. I decided, that this was it, enough was enough, it’s time to call it a day on my training. I’ve trained for 10 weeks, I’ve worked with my tutors, I’m continuing to make progress. My technique, is better every week. This week, I’ve swam three days, another day will make no real difference, I know I can do it, rest would be better. So, my decision was made, rest on Thursday, there’s no point taking a tired, aching body into the pool, on Friday. A rested one, will be far more productive, so my aim for Thursday: eat well, drink plenty, rest lots. Yet again, I find myself with two post’s waiting in the wings, but first I want to post this. I was stood in the queue of my local pharmacy, in typical North-East England style, the lady in front of my started chatting to me. She made reference to the fact that she had just come from the gym, I responded that I was preparing to undertake, Sport Relief, Swimathon. The next thing I know, £2.00 was being placed in my hand, accompanied with the words “good luck”. She explained she had no-one to sponsor this year and therefore, she would like to sponsor me. It was such a lovely gesture, given in complete trust, she didn’t know me from Adam and had know way of knowing if I was telling the truth, yet she, without question, handed me £2.00.